Today, we are going to share best social media marketing tips for bloggers. Social media has been a goldmine for bloggers and marketers because you can drive massive traffic to your site from Social Media marketing. Most of you might think social media is just a onetime investment game where you must create a social media account and publish single post time. But social media isn’t a onetime investment game. You need to invest significant efforts in it daily to improve your social standards and also to improve your influence in particular social media. 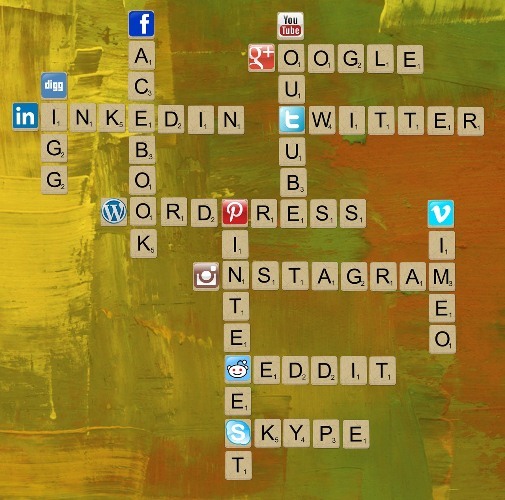 There are numerous social media networks and depending on the social media platform you can create unique strategies. Social media is constantly changing, and there are many new strategies to get to the best of it.What worked last year may not work this year, So you need to test new marketing tips always to improve your social media performance. The best way to reach more people and get more eyeballs on your articles is by adding images to your social media posts. Because using images will increase your post engagement and boost your conversions. So this is the reason why most of the people always look for best images to attain visitor’s attention on social media. You can see many pro bloggers and experts follow this rule these days. So it’s one of the essential social media marketing tips. Always, try to show your post in a story format when it comes to social media, Expressing your views is more important to earn new clients and true followers to your sites. So, just try to impress your visitors with your story and make them read your article. Don’t always embrace your visitors with the same sort of affiliate links to promotional posts? Try to change your content types and try different topics in your niche and be more precise in expressing your content. Also, try to bring up some unique content which will help you to stand out in this huge competitive world. Have you seen pro bloggers always try to add different sort of videos to attract an audience? Video formats are work fantastic on social networks. It’s best to share some exciting videos to boost your social media presence and also it improve your brand name. Moreover, it helps to bring a proper brand recognition in social networking sites. Whenever you write a blog post, just make it useful for your visitors. Don’t just write about always promoting the stuff or take this services etc. Nobody wants to hear about your product over and over again. So just try to avoid that in your social activity. Promotional messages and posts without any inspiration should not be more than 10-20% of the content you create. Most of the pro bloggers believe that tweets are having more potential when you share them appropriately. Now most of you might use twitters tweets a single time for a blog post. But that doesn’t help in this busy world. People are just wondering to see fresh content. So, you must make them look at your content by twitting the similar post in a different manner by changing its title and description, etc. Guy Kawasaki has also shared this best social media technique in his social media marketing course on Lynda. Creating multiple tweets can take time if you want to save your time, then you can make use of free tool missinglettr. With this tool all, you have to do is create a free account and submit your blog’s RSS feed to it. That’s it whenever you produce a new blog post, missinglettr detects that and create a series of tweets, each focus on different parts of your article. It even creates the quotes and images. LinkedIn slide share was specially designed to make it easy to share, embed and amplify you presentations. If you want to take things a step ahead. Then tools in LinkedIn slide share will help you to organize slides and your presentations. Scheduling your social media posts is the best thing to draw visitors to your sites. Generally, social media has huge audience base. And according to the convenient time of the users, they will visit the social media. Now your primary goal is to reach a wide range of audience so it’s best to post your articles three times a day. Guy Kawasaki, the famous marketer, has said this rule in his training session of Lynda. But most people don’t have that time to post your tweets and post. So you can schedule your post to that point in the apps like Buffer, Hootsuite, and meet edger, etc. With the help of these tools, you can just schedule your posts and make your posts visible to other people when you aren’t online. You must create a call to actions buttons to get more engagement from the people. To create a hard to skip the call to action and offer a surprise useful thing for your customer to grab their attention. Call to action is not a new theory to explain in social media marketing, many people do it quite differently. So do in your style but improve your call to action and make hard for your visitors to skip that. The most crucial point in any social media accounts is you should post your content regularly. Particular if you are growing a brand or a website then you need this point. Posting regularly helps to improve your social engagement and also its helpful for your SEO as well. If you are thinking how it is best for SEO, then take a look at overlooked SEO ranking factors of 2016. Even a single customer or visitor is important for any websites and business. So to make sure you aren’t missing any of customer just maintain accounts actively on all social media networks. Don’t even neglect the smaller social network which you might think may not be useful for your site. You never know you can be the famous person in that small social network you missed. You can see many social media accounts are active, but they aren’t that active in engaging with its customers. So it’s better to be visible as a person in social media to improve your authority and also to help some people. Never try to be silent on social media, because if you are not active on social media then seriously your chapter may not be among the top. So be visible on social networks and help as many as you could. Most of the newbies make this sort of mistakes they always look for some likes and shares on their content. If they don’t get, they will be depressed. In reality, you don’t have to look at like and shares, instead of watching them try engaging to your audience in ways that encourage conversations and interactions. If you aren’t getting that then just try to improve your promotion strategy. If people find what you are posting, then they will have a look at it if they need and if they found helpful then they will share it. Hosting live hangouts is a useful social media marketing experience which makes you closer to your audience. The Facebook live video has been incredible working with all the pro bloggers and experts.With these, they are getting huge popularity for their blog and they are building their authority. So try to make a Hangouts session or use a live Facebook feature to go closer to your audience and make them more engaging towards your content and business. To make your posts more trending include the hashtags in your posts. Just research trending hashtags. There will be more trending tags related to your content, just pick the perfect hashtags and post your article. If you want to broaden your reach, then you need to follow existing trends to come up with. Keep an eye on your opponent and just see what type of content they are posting. You can use Facebook insights to know about your competitors reach etc. Also look carefully at the strategy of your competitors and give a try on your site to know the engagement. In this modernized world, people just love giveaways and offers. You can increase your social media marketing reach by attracting your audience through content or give away. You can already see there are many giveaways and a contest is happening these days to increase the brands reach and fame. But make sure you keep some user-friendly competition where ever one can participate. As I already said in the first point that images are the best way to get eyeballs on the posts. But some are moving to advanced steps and making their custom design graphics. Custom design graphics works pretty well, and you can also take a look at some of the pro bloggers who spend lots of money in custom design graphics to simply get attention from the crowd. One of the people who always uses custom designs is Brian Dean. Always try to be an authority blogger or marketer in your niche. Becoming an authority person or brand in social media gives you more business. But to be an authority blogger you should prove yourself by posting unique and uncommon facts.You should help your fellow bloggers. Try some new strategies once in a month or two to improve your user engagement and experiences. Just don’t be afraid to increase your reach and to implement a new social media marketing strategy. 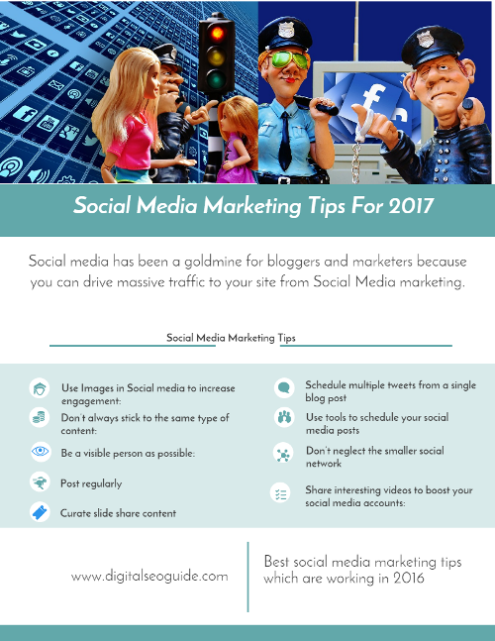 These are best social media marketing tips in 2017 which are recommended by the experts to increase your social media presence as well as traffic to your site. Hope you all are having a clear view on this topic. If you have any queries feel free to shoot a comment. I’d love to hear comments from you. Hey Madhumeeta, In point number 13, you are talking about not counting the likes, but all the businesses demand for that. If likes increase, engagement will increase. Please guide me on this. Concentrate on page engagement, not on likes and shares. If you share some things interesting and valuable than you will get valuable likes and shares instead of waste one. 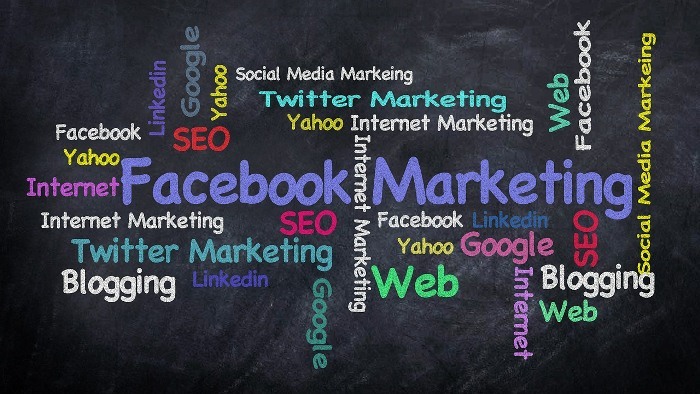 Social media is a now strong way to generate traffic. And it is increasing with every passing day. Everyone should pay attention to this to get some real traffic. Very informative about the social media marketing tips. Till now i know some tips but these tips are much effective. I would like to do my social media marketing like this. Keep postings like this. I create my FB page and buy some followers from it and after that, I didn’t get time to work on it. Is it ok or we need to focus on more organic followers? Please guide me. Social Media is the best Platform for business which are looking forward to wider customer engagement , with the coming up of automatic play video ad’s on facebook , these platforms have become more beneficial for business to reach target customers.Thanks for sharing this article.